The best way to show off the quality of our products is to let your customers see and feel them in person. 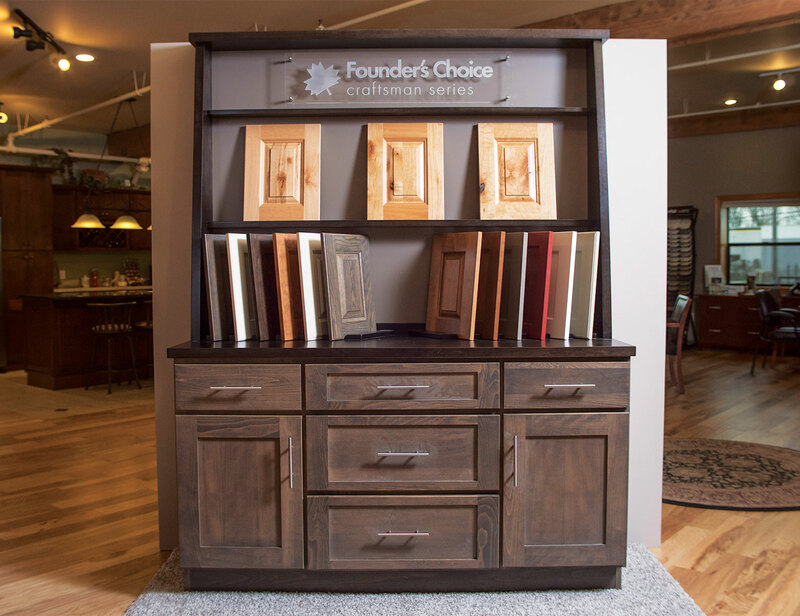 The Founder’s Choice Sales Hutch is designed and engineered to be used as an in-showroom sales tool to introduce the features and benefits of Founder’s Choice Cabinetry. Care was taken to ensure that all of the door styles, finishes and species could be displayed. Stain/Paint chips, brochures, and offered literature will be supplied for storage in the drawers. Trim and crown molding samples will also be supplied for storage in drawers. Slab drawer face and Pioneer door in Beech with an Ash stain. Pioneer doors in Beech with an Ash stain. The upper hutch is our Espresso finish on Birch wood and the backing is painted MDF in Slate. Rail mounting provides space to mount the supplied door samples (in every color). The solid hardwood doors swing for easy viewing and can be removed if needed. All our doors are hardwood, cope-and-run construction. There is plenty of space to display the doorstyles we offer in multiple ways. The upper level shelf gives enough space to showcase three to four additional doorstyles (preferably the rustic offerings). Care was taken to ensure that all our doorstyles, finishes and species could be displayed. Any door may be ordered in any combination. Each door sample will be properly labeled with Doorstyle, Species, and Color or Finish for ease of reference. Please see page 15 of our official Dealer Handbook for a list of what doors come standard with our Sales Hutch. To place an order for a Founder’s Choice Sales Hutch please use your Dealer Order Form. Fill out the order with the corresponding SKU and submit the order to our Order Desk.